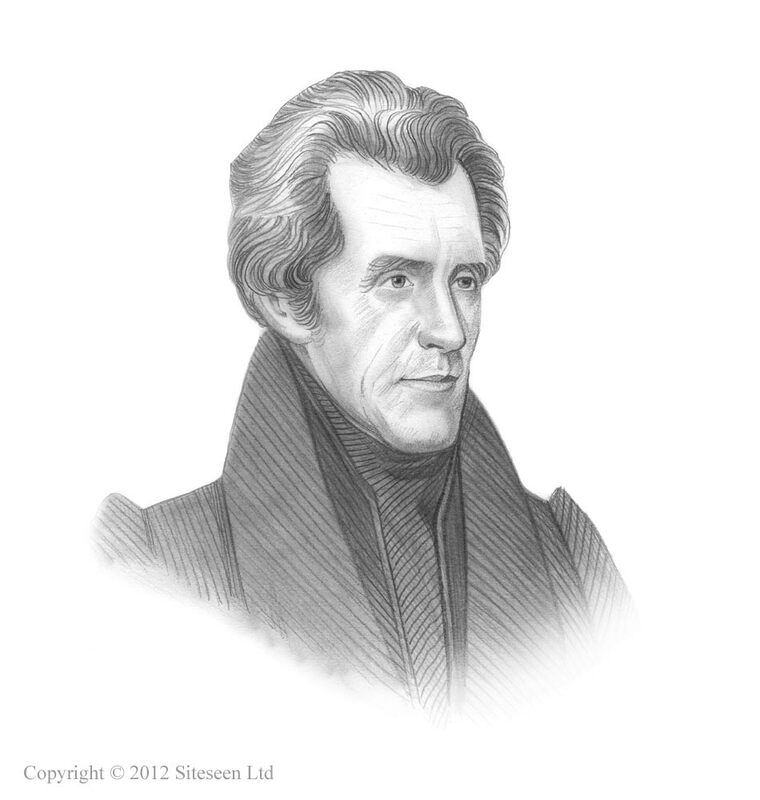 Texas Revolution: Andrew Jackson was the 7th American President who served in office from March 4, 1829 to March 4, 1837. One of the important events during his presidency was the Texas Revolution. Summary and definition: The Texas Revolution, aka the Texas War of Independence, was the military conflict between the government of Mexico, led by General Santa Anna, and Texas colonists. The Texas Revolution began October 2, 1835 and resulted in the establishment of the Republic of Texas after the final battle at Vince's Bridge on April 21, 1836. The Battle of the Alamo was the most famous battle during the Texas Revolution but the Goliad Massacre was also a most notorious event involving the execution of over 350 Texans who had been forced to surrender to the Mexican army of Santa Anna. What were the Causes of the Texas Revolution? The Americans retained trading links with the U.S. Many Americans believed that Texas, and other parts of Mexico, should belong to the U.S. The Battle of Gonzales was the first military conflict in the Texas Revolution fought on October 2, 1835. The small cannon sparked the conflict. The Mexican authorities had given the American settlers of the town of Gonzales a small cannon to help protect them from frequent raids by Comanche Native Indians. As political unrest increased with rebellions in different states the Mexicans demanded the return of the small cannon. The Texan colonists refused and the Battle of Gonzales commenced that resulted in the death of one Mexican soldier and the start of the Texas Revolution. The Battle of the Alamo was the most famous battle in the Texas Revolution. A small group of 180 Americans, led by William B. Travis, Jim Bowie and Davy Crocket battled against the force of a 4000 Mexican army led by General Santa Anna. The Battle of Jacinto was the final battle of the Texas Revolution fought on April 21, 1836. General Sam Houston led the Texan army in the battle that was fought by the San Jacinto River. Vince's Bridge played a critical role during the Battle of San Jacinto. Vince's Bridge was a wooden bridge constructed by Allen Vince over Sims Bayou near Harrisburg. Acting under the orders of Sam Houston Vince's bridge was destroyed by Texan troops led by Deaf Smith. The destruction of Vince's bridge prevented the arrival of re-enforcements to General Santa Anna's Mexican Army (who had divided his force) and resulted in the decisive defeat of the Mexican army, effectively ended the Texas Revolution. The Battle of Jacinto was a rout, as hundreds of Mexican soldiers were killed or captured. General Santa Anna was one of those captured and on May 14, 1836 signed the peace Treaty of Velasco. The demoralized Mexican army, crossed the Rio Grande back into Mexico on June 15, 1836. A notable and tragic event of the Texas Revolution was the Goliad Massacre. The Goliad Massacre occurred on March 27, 1836, when over 350 Texan prisoners, and their commander James Fannin, were executed by Mexican forces. Most of the Texan prisoners had surrendered at the Battle of Coleto which was fought on March 19–20, 1836. The Texans had been massively out-numbered by the Mexicans, led by José Urrea, and had run out of ammunition. José Urrea, acting under orders from General Santa Anna, could not accept anything but an unconditional surrender. The terms of surrender are unclear but it is believed that the Texans were promised their lives and deportment to New Orleans if they laid down their arms and surrended to Urrea. The captives were sent to Goliad. Santa Anna demanded they should all be executed. Urrea tried to convince the general to spare them but he failed. The Texans were to be executed under the command of Colonel Nicolás de la Portilla. The executions were called the Goliad Massacre. The actual number of executions is unclear but estimated to be between 350 to 400. The men were shot, their bodies burned and their remains left to the elements. The Goliad Massacre increased the resolve of the men who were bravely fighting in the Texas Revolution. Interesting Texas Revolution Facts and Timeline for kids are detailed below. The history of the Texas Revolution is told in a factual timeline sequence consisting of a series of interesting, short facts providing a simple method of relating the history of the Texas Revolution and its battles for kids, schools and homework projects. May 14, 1836: The peace treaty of Velasco is signed by the Republic of Texas and General Santa Anna of Mexico. May 14, 1836: The peace treaty of Velasco are signed by the Republic of Texas and General Santa Anna of Mexico. Following the Texas Revolution and their declaration of independence from the Republic of Mexico the vast majority of Texas citizens favored Texas Annexation by the United States. However, this suggestion received significant opposition by the leaders of both Important American political parties (the Democratic party and the Whig Party). The US politicians strenuously objected to incorporating Texas, which was a vast slave owning region, into the United States due to the volatile political climate and the bitter question of slavery that divided the north and the south. In early 1845 John O’Sullivan initiates the phrase 'Manifest Destiny' and on December 29, 1845 at last became part of the United States.